The tattooed portraits are the latest additions to Drake’s collection. 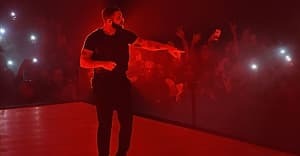 Drake’s tattoos are something like a hall of fame, paying tribute to some of his favorite people. He has two tattoos of Sade, one of Lil Wayne, and another his father. His new tattoos pay tribute to his late friend Fif and Denzel Washington's character Bleek in Mo’ Better Blues. Tattoo artist Inal Besekov’s portfolio includes many detailed, realistic portraits, and Drake’s new tats follow this same style. One tattoo is a portrait of Drake’s late friend and OVO affiliate Fif. Over Fif’s likeness the phrase “FOREVER FIF” is inked, emphasizing the permanence of his place in Drake’s memory. Drake recently commemorated Fif in an Instagram post. The second image is dedicated to Spike Lee’s 1990 character Bleek, played by Denzel Washington. The tattoo depicts Washington holding a trumpet to represent his character in Mo’ Better Blues. Washington and Fif are the latest to be inducted into Champagne Papi’s ink collection, joining the ranks of those most precious to the rapper. Check out his new ink below.